*Provincial/territorial analysis is available for only those jurisdictions that have complete province-/territory-wide coverage and have participated in this analysis. Source: CICH graphic created using data adapted from Canadian Institute for Health Information. Children Vulnerable in Areas of Early Development: A Determinant of Child Health. Ottawa, ON: CIHI; 2014.
https://secure.cihi.ca/free_products/Children_Vulnerable_in_Areas_of_Early_Development_EN.pdf -accessed July 24, 2017. The Social Competence domain of the Early Learning Instrument (EDI)** includes curiosity about the world, eagerness to try new experiences, knowledge of standards of acceptable public behaviour, ability to control own behaviour, appropriate respect for adult authority, cooperation with others, following rules, and ability to play and work with other children. 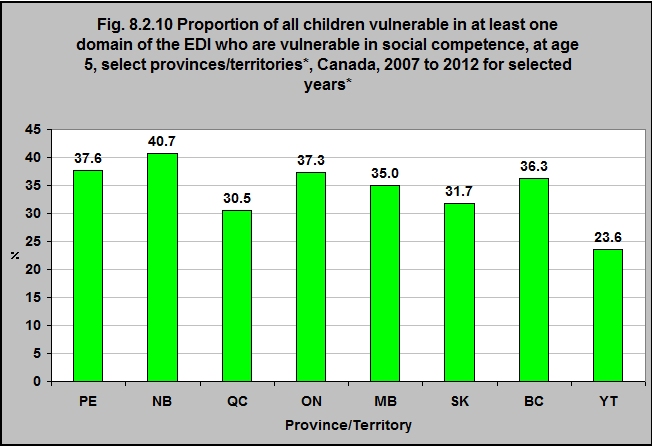 40.7% of all children in New Brunswick who are vulnerable in at least one area of the EDI are vulnerable in social competence. 23.6% of the children in the Yukon who are vulnerable in at least one area of the EDI are vulnerable in social competence.